Julius Abrahamsohn was born on January 6, 1862 in Lengerich, Steinfurt. He was first married a sister/cousin (?) of Rosalia Berghausen from Hohenhausen, Lippe. Their daughter Bertha Johanna was born on March 25, 1891 in Köln. Their son Gustav (* October 10, 1894) fell in 1917 in WWI. Son Josef Levi was born on November 3, 1897 and son Hermann on August 13, 1900. After Julius‘ first wife died he married Rosalie Berghausen (* January 17, 1868) in 1902. 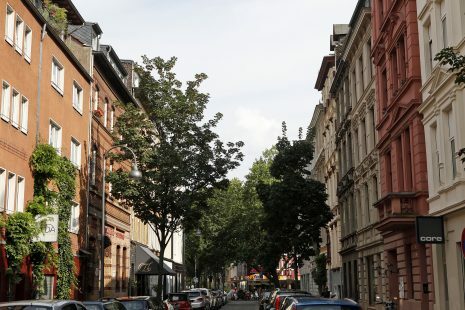 Julius and Rosalie lived at Elsaßstr. 16 in Köln, south of the medieval Severin’s gate. Julius was a scrap metal dealer. Their daughter Emmy was born on August 13, 1902 and son Heinz on October 24, 1905. 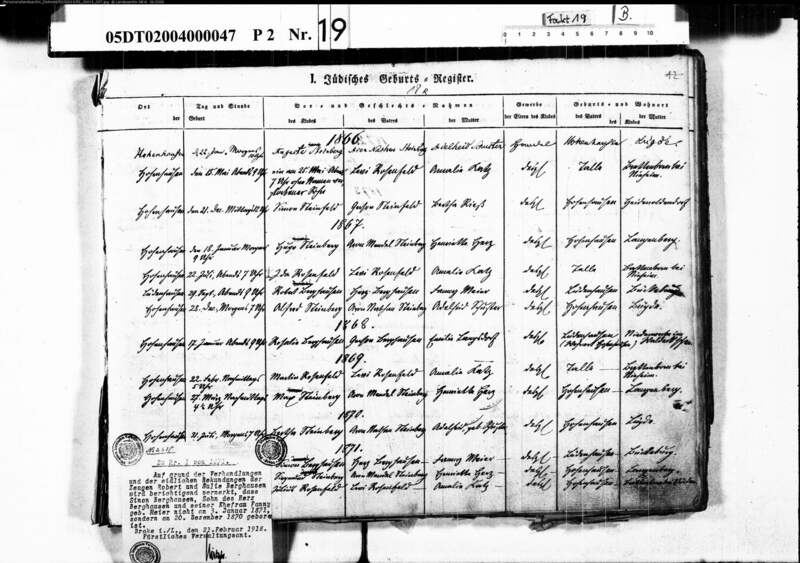 Julius died on April 29, 1934 at the Israelitic Asylum in Köln-Ehrenfeld due to a bladder infection (cystitis) and was buried at the Jewish cemetery of Köln-Bocklemünd. The children of Julius changed their family name to Bramson after WWI. Bertha Johanna married Mathias Bergmann from Aachen. Hermann married Mathilde Ploetz and their son Karl-Heinz was born on December 3, 1930. Josef married Johanna Tobias of Hamm on Sieg on March 27, 1932. Their daughter Margot was born in 1934. 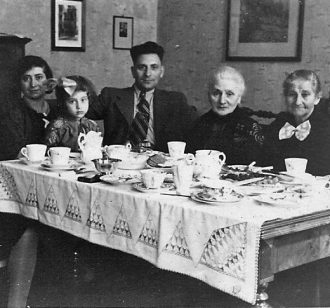 They lived with Josef’s family on Elsaßstr. 16. Josef was a shoemaker but worked as scrap metal dealer like his father. Johanna worked at the butchery Carl Katz on Severinstreet. 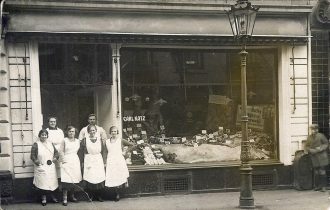 In September 1938, shortly before Kristallnacht, they emigrated from Rotterdam to the United States with their three-year old daughter. They established a new life in Hartford, Connecticut. 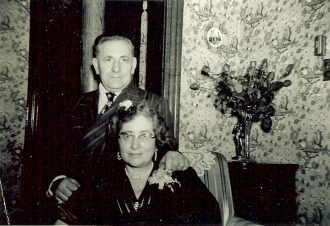 Josef worked as a machinist for the Royal Typewriter Co. Johanna started working at a women’s clothing shop and volunteered at the Hartford Jewish Community Center. 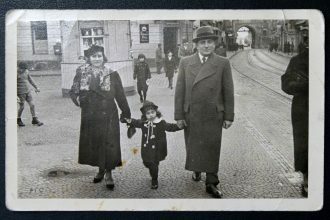 In April 1945 Josef got news that his brother Hermann as well as his sister Emmy had survived the war in Köln, together with her daughter Eva Margarete and son Kurt Heinz. Her husband Martin Fritz, a furrier, had died before the war. The Hartford Courant reported on this event on April 17, 1945. Joseph Bramson, 20 Cabot Street, a native of Cologne, has learned of the safety of his family in Germany through letters from two American soldiers, one of whom is Staff Sergeant Julius Yellen, son of Mr. and Mrs. Benjamin Yellen, 6 Acton Street. Mr. Bramson, who came to America in 1938, had received no word of his brother and sisters since 1939 and believed they had been killed or placed in concentration camps. Sergeant Yellen, however, wrote that a comrade, Staff Sergeant Henry Schueftan, had attended Passover Services and met a Herman Bramson who said he had relatives in Hartford. „Being a Hartfordite myself, it was really thrilling news,“ Yellen wrote. Hermann Bramson, whose wife Mathilde was Christian, was a founding member of the post-war Jewish congregation of Cologne. He was elected chief executive officer, was responsible for the Jewish cemetery and for the first survivors‘ transport from Theresienstadt back to Cologne. He was also commissioned to manage the Israelitic Asylum which was used as a refugee home at the time. Also Bertha Johanna survived in Köln and lived at Roonstr. near the synagogue after the war. Josef’s brother Heinz had emigrated to Buenos Aires before the war. In 1966 a big family reunion took place in West Hartford. Again the Hartford Courant reported on the event on May 29, 1966. About a dozen people sat down to a big turkey dinner Saturday at the home of Mr. and Mrs. Joseph Bramson, 18 King Edward Rd., West Hartford. The turkey dinner seemed fitting: the guests of honor were Mr. and Mrs. Heinz Bramson who arrived in Hartford Saturday from Buenos Aires, Argentina. It was the first time Bramson had seen his brother, Joseph, and his sister, Mrs. Emmy Fritz since he left Germany in 1935, escaping the Jewish pogroms. Mrs. Fritz, who is 64 and lives with [her] daughter and son-in-law at 114 Baltimore St., was among the family members who met Heinz at New York’s Kennedy Airport Saturday morning. 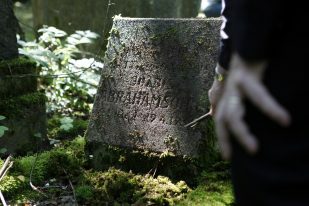 As it was with many German Jewish families, the end of World War II found the Bramsons scattered. The Bramsons, though, were luckier than some. Mrs. Fritz and her daughter, Mrs. Eva Oken, hid out in Cologne cellars during the war. Mrs. Fritz’s son, Kurt, survived the Dachbau concentration camp, and lives now in Hartford with his family. 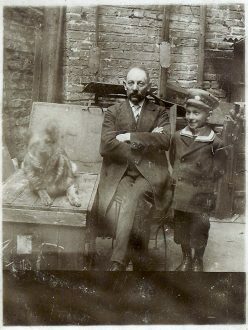 Joseph and Heinz Bramson left Germany before the war. Mrs. Fritz’s mother, who was 71 at the time, died at the Bergen-Belsen camp. This was not forgotten at the reunion, but it was shoved into the background. It was a time for laughter and good food and talk—the youngsters speaking in English and their elders in German or Yiddish. Heinz Bramson, 60, now retired, could tell of his years with the Philharmonic Orchestra in Buenos Aires. He is a bassonist and his talent with the basoon was what enabled him to get out of Hitler’s Germany. He had been playing in Germany and had an offer to join the Philharmonic in Argentina. He took the offer. Joseph Bramson, 68, left Germany in 1937 but Mrs. Fritz and her two children (her husband died a year before the war began) stayed in the country. Mrs. Oken, about 6-years old when the war broke out, remembers living in a home for Jews for a while. Kurt Fritz, a teenager, was picked up by the Gestapo on the street in 1941 and shipped to Dachau. Heinz Bramson will be staying with his brother for a month. Josef died on December 18, 1973. Johanna survived her husband until November 28, 1995. Emmy Fritz died on January 15, 1998 in Orange, New Haven and survived both her children who had died in 1993. Hermann Bramson died in 1981.